SAN ANTONIO, TX -- They killed more rattlesnakes than you could shake a stick at when they were building The Golf Club of Texas at Briggs Ranch. And when they shook the stick countless dove also took flight. It wasn't long that Brian Cook, the head pro, and his staff envisioned a "Birdies and Birdies Dove Hunt/Golf Tournament" on opening day of dove season in September. Yee haw, this is bona fide Texas. If you look closely, the lake to the left of the first tee box is shaped somewhat like the state of Texas. The flags on the pins are, naturally, the state flag. Cook's father is Buddy Cook, the Director of Golf at The Golf Club of Texas, and a San Antonio golf pioneer, who also headed up La Cantera, The Dominion and worked at Oak Hills. The elder Cook envisions a "Golf Trail of Texas", including five or more courses in the mold of Alabama's Robert Trent Jones Trail. This Trail will celebrate Texas history and its customs. Located at the historic Briggs Ranch, west on U.S. 90 toward Castroville and Hondo, the first edition of The Golf Trail of Texas is a Lee Trevino Signature Course designed by Randy Russell and Roy Bechtol. It is 7,125 yards long and traverses Lucas Creek at par 72. It's Trevino's first signature course in his home state of Texas. Tony Trevino, son of Lee, is the Director of Instruction, and offers $80 per hour instruction. You can also break instruction into 45 minutes or 30 minutes or buy a package which includes lunch and golf. And just recently Cook announced that a private golf club, located just north of The Golf Club of Texas, will be designed by Tom Fazio. It will be called The Briggs Ranch Club and will restrict membership to around 300. Bill Rogers, the 1981 British Open champ, and former San Antonio Country Club director of golf, will be involved in the golf-only club, along with The Golf Club of Texas owner Gil Hodge. 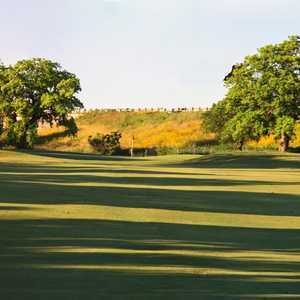 The Golf Club of Texas is located on rugged ranch land that can't be classified as Hill Country, but has rolling terrain. At this point one real draw is that it is remote, quite, peaceful and gives you a feeling of being alone, away from the hustle of the big city. But it is a master-planned golf community, so if you want the solitude play now before the home construction begins. "We've been open since December 18, 1999 and I'm still waiting for complaints," said Brian Cook. "I think people like the shot value and hospitality. I grew up behind the counters of golf courses in San Antonio and I can't think of one course in the area like this one. I just think it is one of the better layouts around. The greens have subtle undulations and breaks and the terrain is gently rolling, not harsh. It was an extremely easy piece of property to shape -- it was all topsoil." The Golf Club of Texas has Tif Eagle greens and Bermuda 419 fairways. At the tee of No. 5 you view a lake carry to a double fairway split by a large bunker. Pick which side you want to be on from the pin placement on this 337-yard par-4. It's short, but there's lots of trouble. No. 8 includes a forced-carry tee shot over a natural area and water. There's a huge waste area guarding the left side. It's 426 yards and a par 4. You climb in elevation on No. 10, at the north end of the property, and have a downhill tee shot of 370 yards. Just north of here is where The Briggs Ranch Club will be built. No. 11 is 458 yards with Lucas Creek all down the right side. Your approach is to an elevated green with all kinds of trouble. A massive trap hugs the green on the right and a pin placement tucked behind it creates a traditional sucker opportunity. The 15,000-square foot clubhouse has been designed in Hill Country ranch-style with limestone rock and tin-metal roof. An events pavilion will seat 300 for lunches or corporate meetings. And there's even a private bunkhouse apartment for visiting golfers attending the club's teaching academy. The cart barn is authentic "barn" architecture found on any Texas ranch or farm. Also find the bronze sculptures -- one greets you as you enter the clubhouse and another of a sitting Indian is perched on the hilltop, watching over the golf course from behind the outside restaurant sitting area. 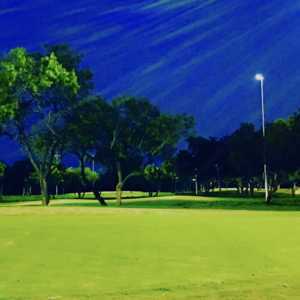 All in all The Golf Club of Texas is a very playable golf course with four sets of tees. But, like any golf course in Texas, it can get windy and the playability gets tougher with the wind velocity. Where to Eat: The GCT Steakhouse, a bar, grill and pavilion that specializes in steaks, has a lofty view of the golf course from its clubhouse location. Directions: The Golf Club of Texas is 25 minutes from downtown. Take U.S. 90 west to Texas 211 (2 exits past Loop 1604) and you will see the golf course on the right.